Remember the dixie cup popsicles we made last week at Little Chef Camp? 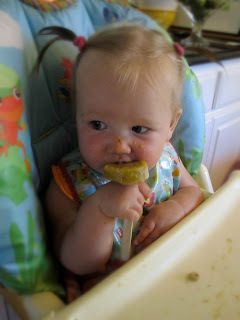 Well, I also made a batch of baby food dixie cup popsicles. For you smart moms out there... this is not a novel idea. But it had never crossed my mind to even try it. 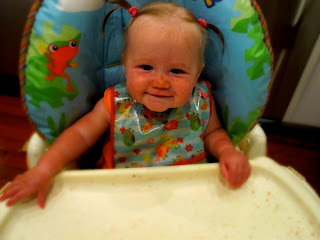 Baby girl was pretty stoked by this epiphany I had. She's teething and has been quite a grump this week. Does anyone else ever wish that they had a parenting coach 24/7 that could share these pearls of wisdom with them? I don't have any older siblings who blazed the path of parenthood ahead of me. I'm making it up as I go along and trying to have fun... and not yell too much. Today wasn't one of those days. Pass along any other great ideas for grumpy teething babies... or babies in general :) I was so sleep deprived when my son was this age I don't remember anything.